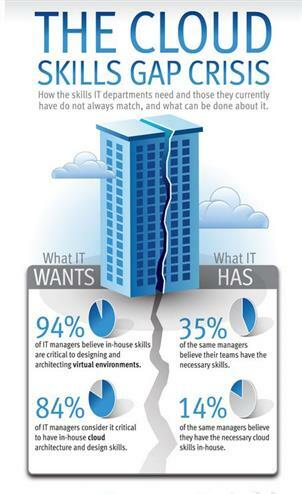 As something of a connoisseur of skills- and cert-related infographics — I seek them out and look at them every chance I get — I was more than a little impressed by a recent offering in that vein from EMC that I stumbled across this morning (thanks, incidentally to the VMware Education Services twitter feed!). The title is lurid and compelling enough to attract some attention on its own (The Cloud Skills Gap Crisis) and the graphics tell an interesting story. The example to the left shows the title graphic, and illustrates what the skill gap is about — namely, the difference between what IT managers want by way of critical skills (left) and their perception of the way things currently stand (right). 1. Storage is moving to the cloud in a big way, because 70% of all capacity will reside in cloud and virtual settings by the end of 2015. Big opportunities for managers to skill up, to counter IT pros’ perceptions that less than 1 in 5 managers possess cloud and IT-as-a-Service skills right now. 2. Big opportunities in “big data”/analytics owing to high demand and short supply, for managers and IT pros with the right stuff. Message: if big data appeals, learning will be rewarded. 3. Subtle plug at the end for EMC education touts faster implementations, improved operations and increased productivity as plusses resulting from their training courses, along with fewer errors on the job. Nice tie-in to the rest of the infographic, and a pleasingly soft sell. All in all, it’s a nice piece of work and worth looking over. And for those whose employers actually budget and pay for skills-related training, it could be a management-friendly sales tool to persuade them to part with some of their budget for this particular kind of training and skills development, along with related certifications.